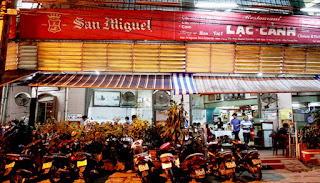 Lac Canh Restaurant is one of the best well known restaurants where serve grilled beef in Nha Trang. This local restaurant is considered the place for you to come to enjoy special grilled beef with over 40 years old in serving. People said that enjoy Nha Trang cuisine, enjoy grill beef in Lac Canh Restaurant. It becomes such an interesting sentence that attracts tourists strongly. Lac Canh Restaurant is not the luxury restaurant. It owns simple decoration and locates far from Nha Trang center more than other restaurants. For many years the space has not changed so much. Visitors come here enjoy food and enjoy the local atmosphere warmly without so much line between guests or local people. Because the space is not changed so much for years and the guests who come to taste increasingly, you may see the overcrowding state in the afternoon if you come without booking table before the time you come. So there is an advice that in the case you love to enjoy dinner there, you should book a table first. Especially you have your big group of people; you need to do that to avoid the full state on arrival time. Lac Canh Restaurant is the local restaurant with simple décor but you can taste the best flavor of grilled beef here. Some people considerate that there is no place else where can serve the flavor like this in Nha Trang. It is said that the beef is so delicious here because there is the special traditional sauce that makes by the owner. For more than 40 years old in serving, the taste has not changed. Reality, there is a rich list of good dishes in Lac Canh Restaurant. You can find in the menu the delicious dishes such as fish salad, dishes with eels, shrimps, squid and fried rice combined with seafood etc. However the best dishes here all people enjoy mostly the grilled beef because it is the specialty. The price for food in Lac Canh Restaurant is not expensive. You may pay about $6 for a beef dish for 2 servings (it is about 130.000Vnd). The other dishes are in the price of $3 or more. So the price for food in Lac Canh Restaurant is not the matter to any guests who come here to enjoy food. Although Lac Canh Restaurant is praised for different elements such as food and price, you should not put all your absolute eagerness in here. The local restaurant is not the luxury restaurant with the highest standards in services. It serves you in the simple way in the simple space. And sometimes the crowding becomes the reason that disturbs the timely serve to you.